I'm running Myth29.1ish on macOS 10.12.6, with an HDHomeRun Connect picking up UK Freeview. I'm having troubles collecting a full set of scanned channels in MythTV - could someone please guide me as to how to do this effectively? If I clear the channel list in Myth Setup and run an Import Scan, I end up with a fairly consistent list - but still missing a lot of channels listed in the HDHomeRun control panel. Am I going about this in the right way? Should I be doing a Full Scan or an Import? 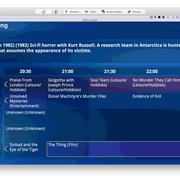 o Channels 68 and 69 are missing on HDHomeRun but present (but without EPG data) on Myth. The rescans were done two days ago, so there's been plenty of time for the OTA EPG to be picked up. Any thoughts? 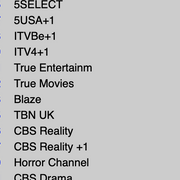 Anyone else in the UK using HDHomeRun with a complete set of working channels?